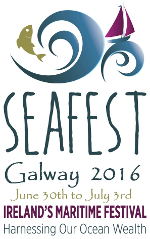 Global leaders in the maritime sphere convened in Galway on Friday 1 July 2016 for the third Annual Our Ocean Wealth Conference which will took place in the National University of Ireland, Galway. The Conference provided delegates with an update on the progress in implementing Ireland’s Integrated Marine Plan, Harnessing Our Ocean Wealth. A copy of Harnessing Our Ocean Wealth - Review of Progress 2015 is available for download from the Publications section of this website. The Conference theme was “Into the Blue – Innovating for Our Marine Future”. Three sessions investigated how Ireland can innovate in each of the three goal areas of Harnessing Our Ocean Wealth, namely: A Thriving Maritime Economy, Health Ecosystems and Engagement with the Sea. Sue Barr, External Affairs Manager, OpenHydro Group Ltd.